Google’s version of Android offers a great mobile operating system experience, and the Nexus series of phones matches it with great hardware. In particular, the Nexus 5 offers high-end looks and specifications at an affordable price. It runs on a 2.26 GHz quad-core processor and 2GB of RAM, powering a pixel-packed 1080 × 1920 display. It also sports an 8MP rear-facing camera, a 1.2MP front-facing camera, and a battery which can last for thirteen hours of talk time. Over at TNW Deals, it is currently being bundled with FreedomPop, a wireless service with generous allowances. It offers unlimited texts and calls, along with 500MB of 4G LTE data each month, and there is no contract or early termination fee. Other features include voicemail, tethering, and usage alerts. 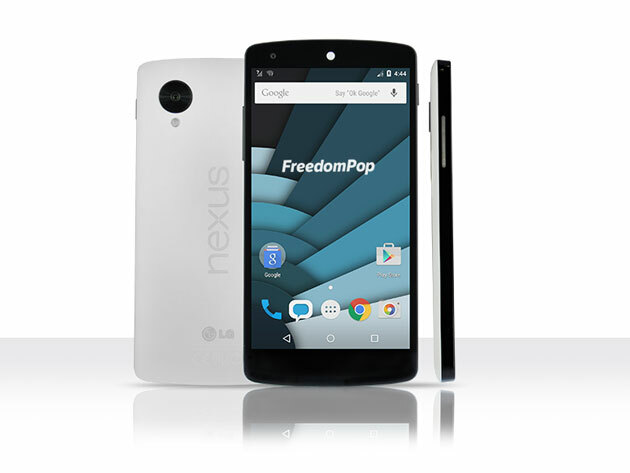 Together, a certified pre-owned Nexus 5 and one year of FreedomPop service is $199.95, with free shipping to the Continental US. The deal takes 65% off the standard price for a limited time, so if you’re looking for a new phone, you should check it out.